For over 25 years, In Flames have been the leading innovators of what many fans call melodic death metal, an effortless (but not easy) blending of elements from hard rock, heavy metal, and new wave. 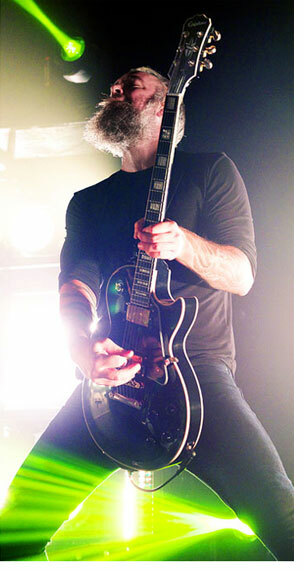 Formed in 1990 in Gothenburg, Sweden, In Flames are known for stretching musical boundaries and inventing new ones. And since 1995, their guiding light has been lead guitarist Björn Gelotte, who was originally hired by the band to play drums before switching to guitar in 1998. 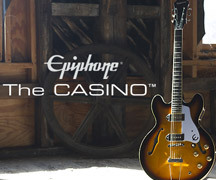 The new Epiphone Ltd. Ed. 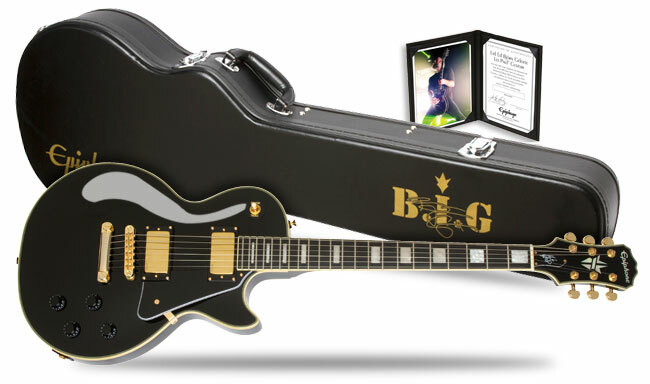 Björn Gelotte Les Paul Custom Outfit was designed by Björn along with Epiphone's legendary team of luthiers and features a classic Mahogany Les Paul body with an Ebony gloss finish, 5-layer cream & black binding, an Ebony fingerboard, and a Mahogany neck with a rounded Custom 59 Profile. 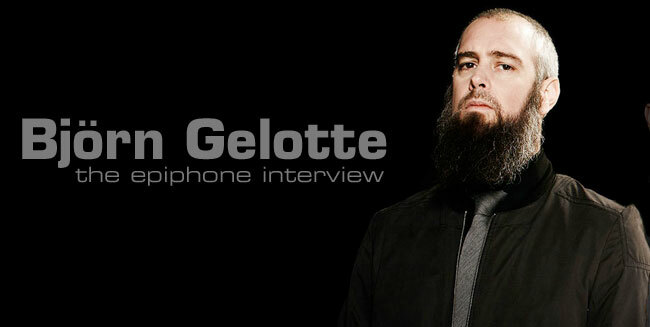 Epiphone.com spoke to Björn about his early days with In Flames, his influences, and all forms of Metal. Björn, welcome to the Epiphone family. Tell us the story behind your Ltd. Ed. Les Paul Custom and how you put it together. Thank you so much! Well, basically I have been kind of reluctant when it comes to signature series guitars. A lot of times the mods take you so far away from the original guitar that you fell in love with, or they tend to get ridiculously expensive. When I got asked to do a signature, I had only one guitar in mind, my No. 1 Gibson Les Paul Custom that has travelled the world with me for thousands of shows and numerous recordings. I recently retired it and was at the time talking to my good friend Alex Markusch, an amazing guitar builder, about making a replica of my beloved guitar. He got to work measuring so by the time the signature was mentioned, we already had all the stats and measurements! I was hoping to make some small alterations but sticking to the original as far as possible--materials, hardware etc. The problem now was to make it affordable and that's when (Epiphone President) Jim Rosenberg stepped in and said I needn't worry about that. No compromise on quality was a promise. I was thinking at the time that the first prototype would probably be so far off that the process would take years. I couldn't have been more wrong. The prototype is my new No.1! It's what I played since I got it! Every show. I am very happy to say the least. Why do you think you settled on a Les Paul as your favorite electric guitar? Several things. First, the absolute beauty of the curves and the general shape, seeing some really awesome players growing up--Slash & Zakk (Wylde) playing the Les Paul sure was another reason. Later, when I finally got my hands on one, it was the weight and the way it played that made this my absolute favorite. You famously started as a drummer with In Flames. How long had you been playing drums when you joined the band? I had been playing the drums for a few years prior to joining the band--only for fun, with friends. I started out as a guitar player but a lot of times there were only guitar players around so somebody had to beat the skins! When I was asked to join the band as a drummer, the guys let me in on the songwriting and had me do some leads on records so I thought it was a pretty cool trade off. Were you already dreaming of making the switch from drums to guitar when you joined? Of course. I am a guitar player and soon after joining, I understood the amount of physical work that's put in by a drummer! I have all respect for these guys steering and guiding us through songs with accuracy and groove. It's hard work. I know that for a fact. What's the story of how you made the switch from drums to guitar? Well as I mentioned earlier, I got to play some guitar on recordings and while writing, so the guys knew my sound and style. When a few members decided to leave, we were faced with the choice between finding another guitar player that would fit in, or to find a REAL drummer. A simple choice--looking back at it now. But at the time I was scared shitless; we had started to tour and play some bigger shows at festivals so being put up front on a huge stage after being safely stowed away in the back was terrifying! But the way you can interact with the audience--being in their face--is so rewarding that I soon grew to love it. How has drumming influenced your guitar style? I think I have gotten an understanding of how to arrange songs--also of what is actually physically possible to play. How to use the drums as more than just a metronome throughout the song. Do you ever have the urge to go back and play drums in the band again? Nope - our drummer Daniel Svensson is such an amazing drummer that the thought never crossed my mind. When you play guitar at home, what do you use to practice and compose? When I practice (which I don't do nearly as often as I should), I usually play through a small combo - Roland Cube or a Marshall. When it comes to composing, I play through my Elevenrack since I always record ideas in Pro Tools. The band recorded their last album at Hansa Studios, one of the world's great rock and roll recording studios (David Bowie, R.E.M., Nick Cave). What is the best kind of studio environment for In Flames? I imagine from the power of your recordings you prefer to work live. You would be surprised at how we work, but having nice, inspiring surroundings always help getting the juices flowing. A studio like Hansa--located in the midst of Berlin with all its history and culture--really added not only to the experience, but the actual mood and sound of the album. Where is the sound of the band headed now? We are, and have always been, a melodic based Metalband. How other people want to categorize us has changed over the years, from Death Metal to Rock. It never really bothered or limited us musically since we kind of do whatever we want. It might sound arrogant but that is the truth: you simply can't cater to the whole world or anyone outside the band. That would mean compromising on our way of music and that--to me--would be selling out. There are a number of bands such as Trivium and Killswitch Engage who have said they've been inspired by In Flames. Do you see them as colleagues or as competition? Colleagues absolutely! And great friends that we have had the fortune to tour with several times. It makes you so proud and humble hearing someone being inspired by your work and to be blown away by the sound and style they created themselves. Very inspiring. When you first started out, you were inspired by American heavy metal bands. Today---thanks to In Flames---"metal" is really an international sound. Would you still describe In Flames as metal? Actually I would say that the British and European rock and metal had more influence in the beginning, later the Florida death metal scene made a huge impact on me, so in the mix between melodies and aggression is where I kind of brew my music. We all in the band have different musical influences, but our musical background I believe to be similar. You and Anders Friden have been with In Flames the longest. What keeps that friendship so strong? The love of what we do, the love of music, the communication-- both musically and on a personal level. All these things combined with the ambition to explore music and to take this band as far as possible I would say, it's hard to put words to describing a friendship that is essentially a brotherhood. 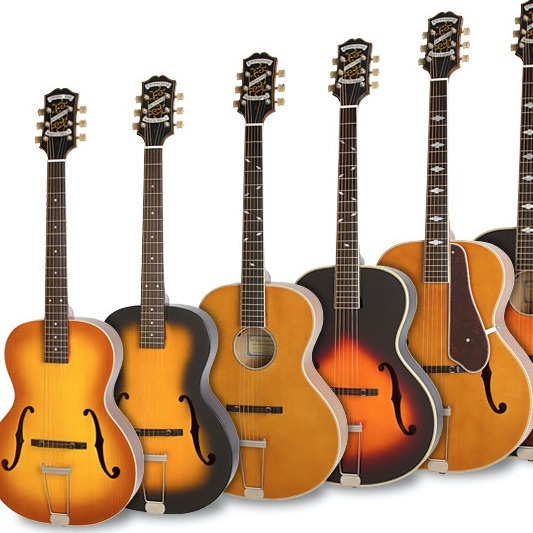 Are there other guitars in the Epiphone line that you're interested in trying out or perhaps modifying into your signature model? Perhaps an acoustic signature? I haven't really given that much thought yet since I am eagerly awaiting my new No.1!